Chances are that if you are reading this list you live somewhere cold, or are at least going to visit a place that is cold. To do so effectively, you will need a winter coat. Without one, not only are you at risk for getting sick, frostbitten, and freezing to death, but you are destined to feel absolutely miserable. Why put yourself through the misery when there is such a simple fix? Get a winter coat! There is no way around this, nor should you try to create one. With so many of them on the market, there’s not excuse. You can even find ones that are tailored specifically to your needs. Are you going to be skiing, snowboarding or sledding? There are coats perfect for those outdoor activities. Do you simply want to keep warm while remaining fashionable? Fear not. Those winter coats are out there, too. Just like we believe that winter coats are a necessity, so do we believe in updating our guides. We want to make sure that our readers get the best and most updated content that we can offer. In this update, we made sure that getting right into the guide is easier. Winter coats are a wonderful thing. They offer warmth, comfort, style, and function. They are definitely a necessity if you are planning your next winter trip. Or, again, if you live in a climate with long and cold winters, they are necessary for getting through everyday life. Whether you have a decent walk to get to your car, if you need to walk around your campus, you have to take your dog out for a walk, or you are about to embark on scaling Mt. Everest. There is no excuse too little or big where you wouldn’t need a winter coat. To say there are a lot of options to choose from would be a massive understatement. Which one do you choose? Look into what your needs are, but look no further than this guide. We’ve selected 10 of the best that you can find on the market, though we know there are even more than that out there. The ones that we selected cover a handful of varieties so there is sure to be at least one that catches your eye. If the first thing you think of when thinking of winter coats is fluffy and warm, then this coat it for you! It is lightweight, durable, and made completely of polyester. It is completely lined with faux fur and guarantees you’ll always be comfortable wearing it. In addition, this winter coat has a deep, fur lined hood that is very effective at keeping your head and neck toasty and warm. One very important part of a winter coat is its cuffs. This coat comes with long sleeve cuffs that fit snugly so that wind and cold cannot make their way up the jacket. The cuffs go to your wrist and won’t ride up at all. One of the ways this winter coat effectively mixes fashion with function is by including an adjustable drawstring belt. This allows you to cinch it up tightly or loosely, depending on your preference, and add a cute element to your overall look. This coat is both cheap and well made. It’ll keep you warm in cold temperatures and help you be fashionable at the same time. It’s not a name brand, but that doesn’t mean it isn’t high quality. It has all the looks and function of a well-made coat but doesn’t come with the price of others on this list. If you’re looking for an affordable coat, or only need one for a trip this one is an excellent option. It won’t break the bank but will give you all the function you need. Isn’t effective in subzero temperatures. Doesn’t handle getting wet well. This coat comes in both men’s and women’s styles and sizes so there is one to fit everyone in your life. It’s windproof and waterproof and is perfectly capable of keeping you warm on a day out on the slopes. It looks good and is comfortable as well. This coat comes with lots of pocket options. There are two on the outside for your hands, a zippered waterproof pocket on the chest, another inside zippered pocket, and a cross pocket big enough to fit your wallet. You won’t be lacking pockets here. As you well know, an important part of any winter coat that promises to keep you warm while out enjoying the elements is that it has to be waterproof and windproof. Those are two big factors in staying warm. A coat can be nice, thick, comfortable and warm, but it’s nothing if it can’t keep the wind and water out as they are both very likely to happen at any point when you’re out. 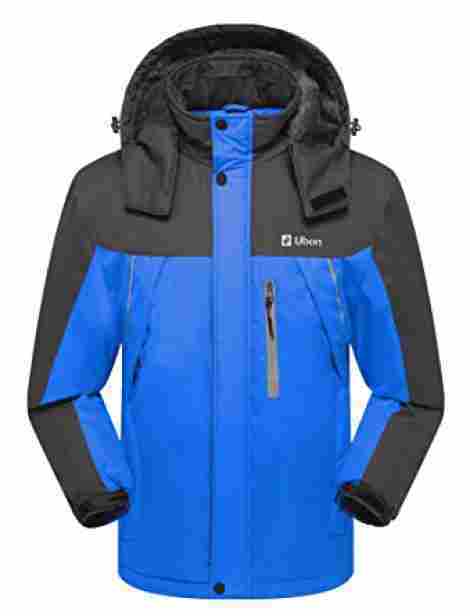 This winter coat will protect you from both with its professionally coated fabric. If you’re looking for a nice, warm jacket to wear on the slopes or while out mountaineering in freezing temperatures without spending a ton of money, look no further. This coat will absolutely do the job. It’s got a lot of the features of more expensive, well-known brands but at a fraction of the cost. It will keep you warm and dry without hurting your wallet. There is something very appealing about a down jacket. It is reminiscent of a nice warm bed on a cold night. That is exactly what this winter coat feels like when you wear it out. It does an excellent job of keeping you warm even when it’s below freezing and has a unique style that will have you getting compliments every time you wear it. This coat has nice, big pockets that offer a lot of storage. You do need to make sure you remember to zip them shut before bending over, but they will hold a lot and provide a unique look to the coat as they are positioned a little differently than your standard coat. There are zippers at the bottom on both sides of this coat. This allows you to zip them up if you need a little more space or air, or leave them down if everything is fitting just as you want. It adds a fun, unique, variable to an already unique and very functional winter coat. If you truly want a winter coat that keeps you warm when the cold really strikes, you have to pay for it. The same is true if you want some sort of fashion in your winter coat. These things are not cheap, nor should they be. That being said, you will notice the cost of this coat; although it’s price tag is much smaller than some of the others on this list, it is absolutely worth the cost. Additionally, it will keep you warm and in-style for a reasonable price, especially when you consider all the value you will get. This coat is one of the most customizable on the list. It has zippers, pockets, and drawcords galore. This allows you to have a hood or not, tighten things up a bit, and store whatever you want depending on your mood. In addition to all of that, it is very warm, even in the coldest condition, water-resistant, and windproof. It is made from 100% polyester inside and out, and completely machine washable, which is more than what some coats can say. There are adjustable draw cords at both the waist and the bottom of the coat so you can cinch things up to keep the cold out or to optimize fit. Having them in two places really boosts your ability to customize the coat to fit exactly how you want it to. Need pockets? This coat has them! There are seeming pockets everywhere - on the chest, on the bottom of the coat, and even on the sleeves. Some of them even have an extra zippered pocket on the outside of the bigger pocket. You will be able to take along whatever you need and keep it all separated! The only problem will be remembering which pocket you put it into! This is a great coat for a decent price. It does largely protect you from the elements while providing you with some extras, so it does cost more than the most basic coats. If you're looking for something a little more complex, a little more durable, and something with a trusted name in quality this coat will be worth every penny to you. This winter coat is waterproof and windproof and offers several other cool features that will make you glad you purchased it. It has a stretchable powder skirt to ensure extra warmth and an earphone port. The inside feels soft and comfortable but the outside is just as functional as you want it to be. The stand collar, removable hood, elastic cuffs, and velcro all work together to help keep the wind off of you effectively keeping you warm when you need it the most. Something that will make your life much more livable - and most importantly warm - in cold, wet weather is the ability of your coat to dry quickly. That way, if you do get rained or snowed on and get the opportunity to go inside for whatever reason, you can rest assured knowing it won’t be all day before you’re able to wear your coat back out in the elements. It will also dry quickly outdoors or if you spill something on it. This is definitely a helpful element to have in your winter coat. All things considered, this coat is relatively cheap. It falls towards the bottom of this list in price. You will miss out on the quality and some of the cool upgrades that more expensive coats come with, but if all you need is a functional coat that will keep you warm without spending a ton of money, this coat is exactly what you need to get the job done. Raise your hand if you like being wrapped up in a big, warm blanket! That’s exactly what wearing this coat feels like. It is completely lined with faux fur on the inside with a windbreaker type material on the outside. It’ll keep you warm and the outside lining will keep you dry. As mentioned, this coat is completely lined with faux fur. That makes for a bold - and very appealing - fashion statement. This coat will not only help to keep you warm in the winter, it will also allow you to still maintain your higher level of dress standards. It’s cute, unique, and will garner many compliments, so make sure that’s something you’re prepared for before you make this purchase. Anything that consistently gets reviews that state “it’s like wearing a warm blanket” is a win in my book. Perhaps because of its fur, but also largely because of its design it gives the feeling of being wrapped up in a blanket. If you size up (perhaps several sizes) it will be big, flowy, and you can wrap it around you just like you do a blanket. The biggest perk here? It’s totally socially acceptable to wear it outside, recommended even! This coat is among the cheapest on this list. If you get the best version of this coat, the one that fits well comes with a zipper and has solid stitching it’s like winning the lottery. However, that is not always the case so it may, in fact, be like playing the lottery. Overall though, this coat will keep you warm and keep you looking good at the same time without spending any more than you would on going out to dinner. The North Face is a big player in name brand winter coats, among other things. As such, you would expect it to perform well and not leave you disappointed. That is absolutely the case here. This is a well-constructed trench coat style winter coat that will keep you warm from your head to your knees. It is down filled and faux fur lined for an extra hint of fashion. The zipper on the Arctic Parka works from both the top and the bottom. This allows for a little more customization in sizing as well as style and function. If you need something from the bottom but don’t want to go through the whole process of unzipping your knee-length coat from the top, that is no problem here! Just unzip from the bottom up until you get what you need and zip it back down. The hood on the winter coat is lined with faux fur. What if you love the coat but don’t like the fur? Or, what if you just need to take the fur off for a day or two? That is no problem here! Not only is the hood fully removable, but the faux fur is removable from the hood with a zipper as well. This is a very nice name brand coat and you will be paying for it. It is definitely higher up on the list as far as price goes, though still far cheaper than the most expensive. 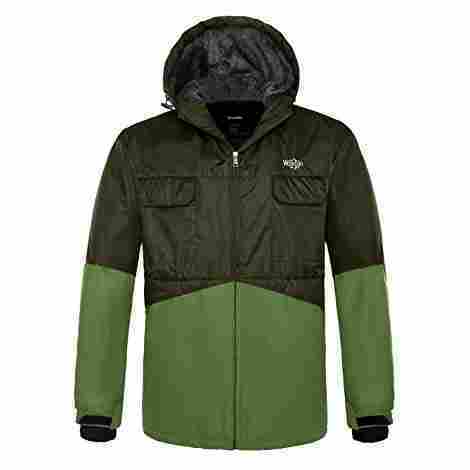 If you’re only looking at quality name brand coats, The North Face is usually at the more affordable end but still provides quality that you will love and appreciate. 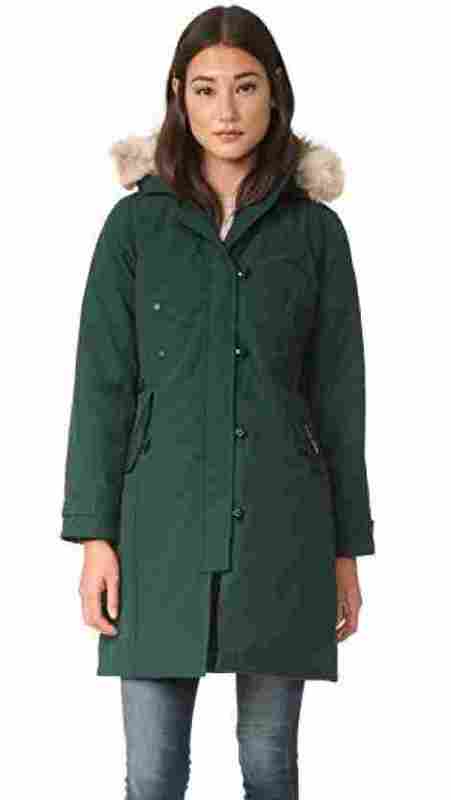 This Marmot coat is a little different than others on the list because it is more of an outside layer than a complete coat, but is designed that way and will easily fit over an insulating layer. That being said, it’s still worth considering for a number of reasons. Unlike others on the list that are just water resistant, it is fully waterproof but also maintains breathability to help prevent you from overheating. It is small enough to stuff into a water bottle when you don’t need it and it comes with its own pack pocket to fold into. 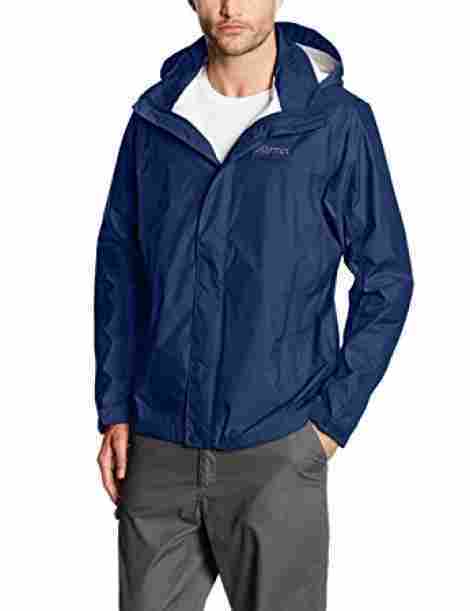 Not only is this jacket made of a specialized material that will allow sweat to travel out while effectively preventing any sort of precipitation from getting in, it also features an underarm zipper to further prevent overheating. 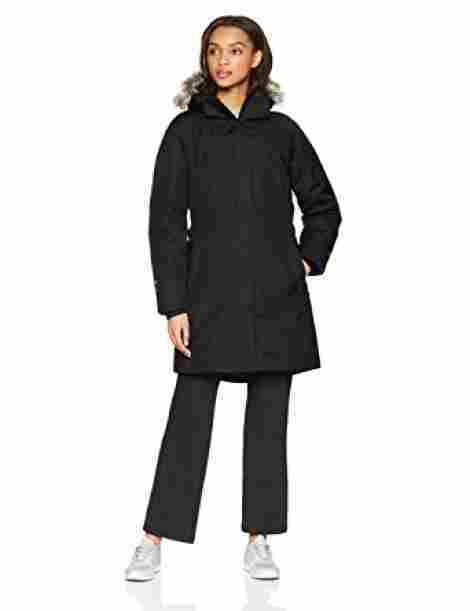 The zipper extends into the body of the coat and is easily unzipped if you get too warm and zipped back up to seal out the rain. 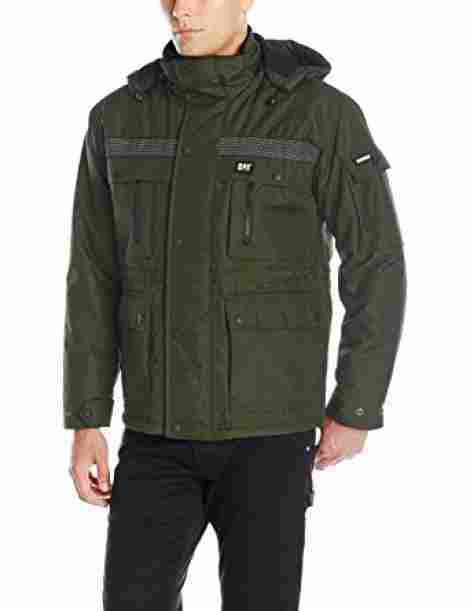 Despite its completely waterproof shell, this coat still maintains a full range of motion. It is an incredible, and somewhat rare thing, to be able to fully move your arms up and down and all around when wearing a coat. 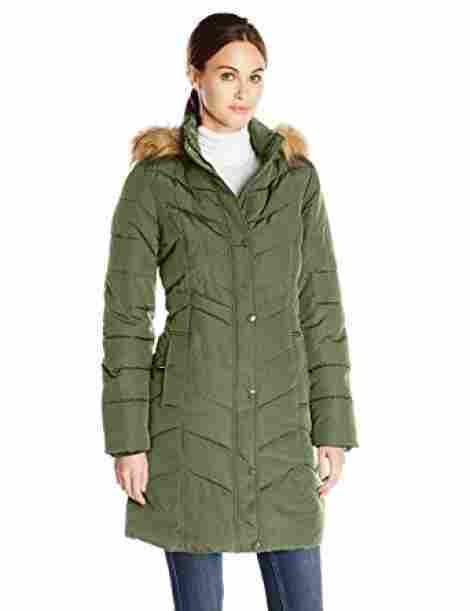 While this is another name brand coat, it is still reasonably priced. A little bit of that is countered by the fact that you will require an underlayer if you want any added warmth. All things considered, it’s still mid to high range on the cost scale but is absolutely worth it if full waterproof-ability is something you need. You can be sure that Tommy Hilfiger makes quality merchandise. That rings true here too. This is a warm, down alternative coat that hits just above the knee. It has a neat chevron pattern and looks and feels great on. This winter coat comes with both buttons and a zipper. This gives you the option to do one or the other if you have a preference, or if you need to keep warmer, it will allow you to do both and really seal the heat in while keeping the wind out. A big perk to this stunning winter coat is the ability to simply throw it in the washer when it gets dirty. Most coats, especially those made with chevron quilted down, require dry cleaning which is cumbersome and can take longer than you want to wait. That is not the case here. You can look good, be warm, and spill something on your coat without having to worry about paying a fortune to get it cleaned. This is a solid winter coat that will serve you very well even in very cold temperatures. It is a big brand, but because it is made with down alternative, it is still reasonably priced. Because it’s suited to function in the very cold, it’s more expensive than many on this list but less expensive than the others that are meant for extreme cold. Overall, you’re getting a good deal with this coat and won’t have to worry about warmth. If you want the finest winter coat money can buy, look no further than this Canada Goose Coat. It is filled with duck down and has a real coyote fur ruff on the hood - which is fully removable if you so desire. It goes to mid-thigh and has a snap panel in the back to further customize and vent if needed. This is a thick, heavy, solidly constructed coat. It is well lined and blocks any chance the wind has of getting in. Everything used is of the finest material and will ensure that you stay warm, even in arctic temperatures. If you are going to get the Mercedes of winter coats it better be waterproof and windproof. Luckily, this coat is, and does in fact, live up to that expectation. There is nothing worse than a cold, piercing wind that shoots right through. Having a coat that will break the wind makes an incredible difference. This winter coat is made of the finest materials all the way through and the price reflects that. You are absolutely paying for quality here and this is by far the most expensive coat on this list. However, if you live somewhere that gets bitterly cold you’ll appreciate the fact that you splurged and bought the best of the best. A true winter will vary very much based on where you live. People living in the Southern United States are going to experience a much different winter than those living in Canada. As such, both parties are going to need a coat that fits their particular needs. If you live somewhere that gets bitterly cold, you should opt for something that you know will work. Stick to well-known name brands, that likely cost a little more, but will ultimately give you the protection from the elements that you need. Anything less than that will help, but you might be selling yourself short and end up replacing or layering more than you would have to if you splurged in the first place. On the other hand, if you live somewhere that barely touches freezing temperatures a few times a year, then odds are really good that you’ll be satisfied with something far less fancy. You won’t need the waterproofing, windproofing, or the ability to seal out the air that your northern friends will. That being said, there are a lot of places that fall somewhere in between on that spectrum. If this applies to you, you’ll likely be okay either way you go and it will ultimately come down to personal preference. After you’ve determined just how much cold you will need to be blocking out, you will want to determine how long you want your coat to be. Generally speaking, longer coats that hit around mid-thigh to your knee are going to keep you warmer. A thicker, heartier layer farther down is going to keep you warmer, plain and simple. However, some people simply prefer a waist length coat and there are many good options here that will also meet all your warmth needs. 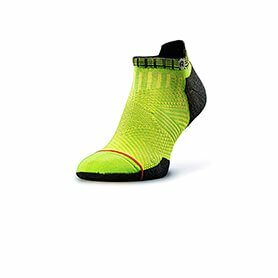 This is a less cumbersome option that gives you a greater range of motion and can still keep you as warm as you need it to depending on which one you opt for. Now you know what type of coat you want, but now let’s answer the million dollar question of what type of insulation to get? There are several options. Let’s explore them. Down is the first one that comes to mind and stands out as nature’s warmest insulator. That alone is enough to make it stand out above any competition it may have. It’s lightweight and easily packable. However, the big downfall of down is that it doesn’t handle getting wet at all. So, if there’s any chance of you sweating or going out in the rain while wearing down with no protection, it may not be the best option. There is such a thing as water resistant down and it handles a little bit of wetness better, but still not great. Another thing to consider is that anything made from down is going to cost more than any of the other options. To anything nature can create, there is almost always a man-made version as well. Synthetic insulation is very good at that. It can be waterproof, which is maybe the biggest pull towards synthetic. It’s okay if you sweat or get wet, no harm no foul. It also dries fast. Synthetic doesn’t pack down as well, is considerably heavier, and is definitely cheaper than down. What if you like both options? Blend them together! Some brands do just that to offer an even better product. This way you are able to get the best benefits of both and counter the negatives. Some do an outright blend throughout, others will do down near the torso and more synthetic on the extremities. This buffers the cost of the down but also allows more waterproofing. Are you someone who likes to wear layers? Do you like to choose and really customize your outfit each day? If so, you may be better served to get a thinner winter coat, or perhaps a liner, that will allow you to put your favorite sweatshirt or fleece underneath. This allows you to ditch layers throughout the day if it happens to warm up a bit or add more on if it gets colder. On the other end of the spectrum, do you feel as if, since you’re spending the money anyway, you might as well get an all in one functional piece? There is nothing wrong with that way of thinking either! Many, many good coats are built to stand on their own and will keep you perfectly warm with simply a t-shirt underneath. The final consideration is fashion or function? Or both? Wearing a coat, while essential in the winter, is making a fashion statement and can say a lot about you and your style. Even, if you are someone who shoots for purely functional, that will be reflected in the coat that you choose to purchase and will put off that idea when people see you in the coat. Winter coats, those on this list as well as others, range the entire spectrum of fashion. You can get fluffy, furry coats that are purely a fashion statement with hopes of keeping you warm. You can also get a purely utilitarian coat that looks like it was made to work hard and get things done. There are also coats that are sleek and clean or formal and stately. The point to take away here is that you don’t have to sacrifice your fashion in order to get a functional winter coat. There is certainly something out there that will please both your fashionable and functional side and you’ll likely be surprised at how much the two weave together once you start looking for your perfect coat. Q: What size do I order? A: Look at the manufacturer’s specific size chart to determine the size you want. Many manufacturers are in different countries and will likely size differently than what you’re used to. A: Yes, most hoods are detachable. Q: Is the fur detachable? A: If the fur is a ruff on the hood, then yes, it is usually detachable. If the fur is the lining, then the answer here is no. Q: What temperature can this coat withstand? A: Generally speaking, the more expensive the coat the colder the temperature it can withstand. With that being said, don’t take much stock in temperature ratings as they are based on a dry, not a windy day – which doesn’t accurately present most of the winter. Q: Does this winter coat have thumb holes? A: Unless it specifically mentions them in the description, then no. Q: Is down worth the extra cost? A: If you’re truly looking for the most warmth possible then yes, it is worth it. Q: Does the stitching come apart? A: Often, yes. To avoid this issue, be sure to buy a quality coat from a reputable vendor. Q: How do I clean my winter coat? A: Most require dry cleaning. Check the tags to be safe before you do anything. However, if it’s a surface stain most can be wiped down. Q: How do I store my winter coat in the summer? A: Short answer: clean it, zip/button it up, put in on a hanger in a cool dry place. If you must cover it and it is down or another natural fiber avoid using plastic and opt for fabric garment bags. Q: What is the best winter coat to buy? A: Read this list! Only the best coats were included here and you won’t be disappointed.